So-called “mini-Breeders’ Cups” are a growing trend, but are they always a good thing? With the Saratoga meet extending over 40 days, does it make sense to cram nearly half the Grade 1s (6 of 15) into a three-hour period on a single one of those days? At a time when attendance has been in steady decline, wouldn’t it be better to keep the major attractions more evenly distributed, to give people — especially close followers of the sport — more of a reason to come to the track all seven weekends of the meet, not just four or five of them? Two weeks ago, the Breeders’ Cup Classic looked as though it would be a showdown between two California 3-year-olds. Now it’s setting up as an East Coast vs. West Coast sophomore clash, after Belmont Stakes winner Tonalist exited a troubled Jockey Club Gold Cup with his second Grade 1 win and an improved, blinkers-off running style, and undefeated Shared Belief was tested, but not bested, by trainer Bob Baffert’s duo of Fed Biz and Sky Kingdom in the Awesome Again. Both winners reportedly came out their races in fine shape. At Santa Anita, the stewards have already handed Victor Espinoza a seven-day suspension for the Awesome Again, in which his mount, Sky Kingdom, the longest shot in the field, steered Mike Smith and Shared Belief toward the center of the track on the first turn and then kept them running wide until he tired on the far turn and fell back to finish last. 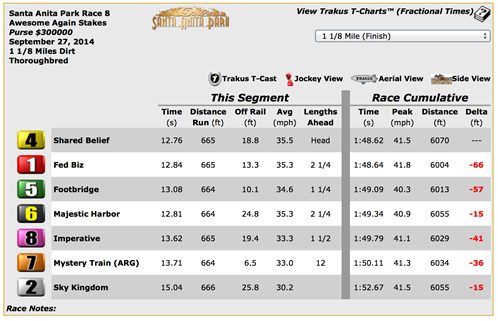 Trakus shows Shared Belief running 66 feet more than runner-up Fed Biz, who had a rail trip. Whether intentional or not, writes Mike Watchmaker, “what Espinoza did in the Awesome Again looks bad. Really bad. It appeared unprofessional.” You can judge for yourself: Watch Santa Anita’s HD replay.